While the Act touches a wide range of provisions throughout the Internal Revenue Code, the charts below highlight some of the most important provisions that affect businesses and individuals. Note that beyond the changes noted on the charts, numerous deductions and exemptions are eliminated on the individual side, and far-reaching changes are made on the business side, especially in the international area. 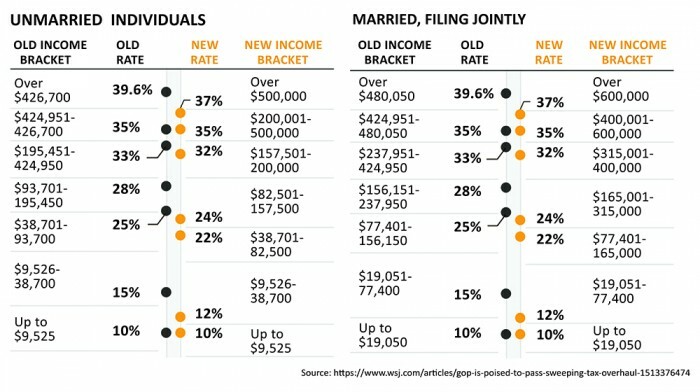 The tax revisions contained in the Act mean new rates and thresholds for millions of tax filers. Take deductions in 2017 that have been eliminated for future years. Defer the recognition of income to 2018 to take advantage of lower rates. Pay both installments of Real Estate taxes in 2017 and all 2017 State and Local income taxes in 2017, but be mindful of the potential impact of the alternative minimum tax in 2017. Individuals should consider accelerating charitable giving to push more into 2017 rather than 2018. Although charitable deductions have been preserved, the actual tax benefit may be reduced as a result of the elimination of most itemized deductions in exchange for a larger standard deduction. Entertain clients in 2017, as no part of non-meal-related entertainment expenses will be deductible under the Act. Business meals continue to be 50% deductible, as under current law. Deduct all unreimbursed employee business expenses as no deduction will be allowed after 2017. Contemplated conversion of IRAs into Roth IRAs should be deferred to 2018. Any IRAs converted earlier in 2017 can be unwound this year and converted after December 31, 2017. Defer items included in the AMT computation, such as gain from exercise of incentive stock options, to 2018 in order to take advantage of the increased AMT exclusion amount in the Act. For more information, please contact a member of Glaser Weil’s Tax Department: Barry Fink (310.282.6229, bfink@glaserweil.com), Joseph Fletcher (310.556.7825, jfletcher@glaserweil.com), Michael Chambliss (310.282.6295, mchambliss@glaserweil.com) or your Glaser Weil relationship attorney.